ICC Northwest began manufacturing pharmaceutical tanks in the early 80’s under the trademark name of JVNW. A few projects at a time for local companies, keeping our focus on quality rather than quantity. 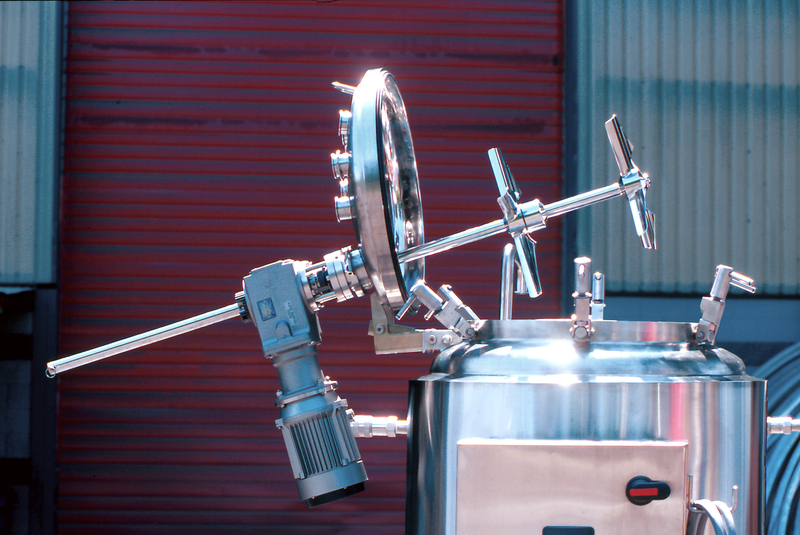 It wasn’t until we moved into our state-of-the-art production facility in 1997 that we were able to produce tanks in sufficient quantities to service the growing pharmaceutical industry. ICC NW is equipped for riboflavin testing, a procedure that coats contact surfaces with a riboflavin solution, once the Clean-In-Place (CIP) devices rinses the surfaces, any harboring trace amounts of contaminates will be illuminated by an ultraviolet light. 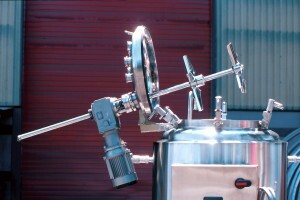 This procedure allows us to guarantee 100% CIP coverage of the vessel and mixer. We are an ASME coded facility, fabricating vessels and our own line of sanitary mixers that includes the ultra-sanitary Sanifoil impeller. 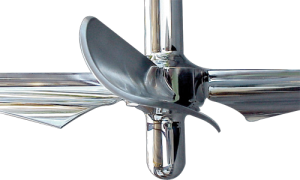 The Sanifoil is our most sought after impeller, its proven performance is completely “CIP-able”, eliminating all shadows. 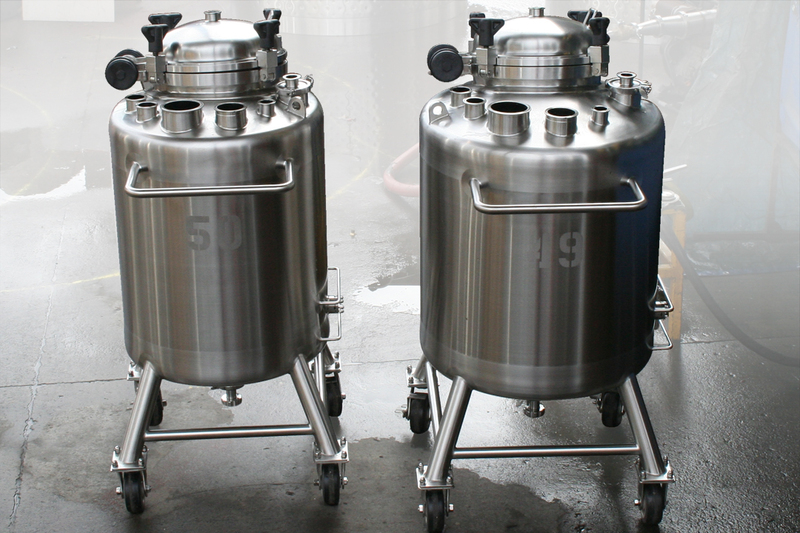 Portability is often extremely important, ICC NW is capable of fabricating portable vessels for steam sterilization, this includes the castors themselves. 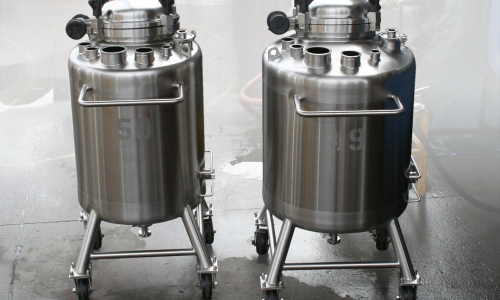 Please view our photo gallery below for images of a vertical portable vessel that lays horizontal during the steam sterilization process. ICC NW’s Polishing Unit is powered by a 7500 amp/480 Volt DC rectifier. RA or RAVE: Roughness Average, the measurement of the peaks and valleys of the stainless surface, is typically measured in micro inches. The process of electropolishing will improve the surface finish (RA) 10% to 20%. An RMAX measurement is a stricter measurement, measuring the highest peaks and lowest valleys and grading the finish on those measurements alone. The Sanifoil impeller was designed in response to increased demand for improved clean-in-place (CIP) performance of top entering mixers. 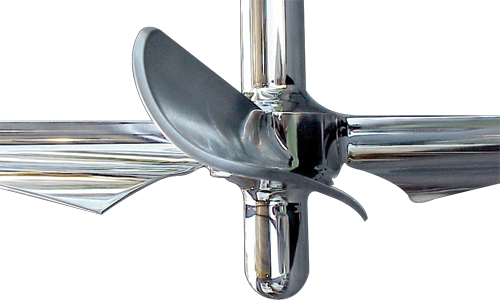 The sleek “S” shaped design creates agitation patterns identical to standard impellers. The difference lies in the accessibility of the underside of the blade to CIP cleaning solutions during the vessel cleaning process. 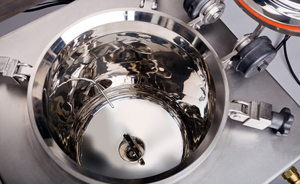 The underside of an impeller within a sealed pharmaceutical vessel is a cleaning challenge for the processor. Standard impeller designs often create a CIP “shadow”, an area that is not reached during the cleaning cycle and is difficult to clean. The Sanifoil impeller is a combination of an Axial Flow and Radial Impeller blade that, during the CIP process, allows the entire underside of the blade to be thoroughly exposed to the cleaning solution, eliminating impeller CIP shadows. Problem met solution when ICC NW’s creative engineering team crafted the telescoping shaft to accommodate a hinged top, thus requiring minimal clearance. The hinged shaft allows for disassembly of shaft and impellers without pulling drive from vessel. Seal assembly is attached not to mixer shaft, but to the quill shaft, for ease of maintenance and testing. When requested, ICC NW offers complete certification packages that include welder certification, material certification, drawings, all test reports, finish testing with profileometer, finish maps, and weld procedures. Sprayball Test Procedure and Cert. ICC NW is the leading West Coast supplier of vessels to the Nutraceutical Industry. Our in-house head forming and electropolishing departments shorten lead times, our Rheology Lab provides technical support, and all welders are ASME certified and follow a formalized Quality Control program. For over twenty years the engineers at ICC NW have been creating innovative designs for process vessels with products ranging from garlic to gingko. 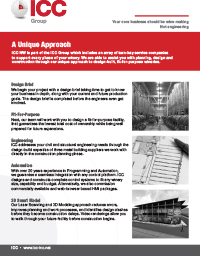 We can help you adapt to changing product lines and keep your systems flexible. ICC NW builds full scrape vessels with off-set turbines, dual motion full scrape tanks with counter-rotating turbine agitators and bottom sweep mix tanks. Fixed position spray-balls are custom drilled to match each tank and are tested for complete Sterilization-In-Place (SIP).